I made this potato salad over the weekend. I'll share a secret with you , I hate to make potato salad, and I don't like to peel potatoes, even with a peeler. My Mom made the best potato salad, so when I needed potato salad for a party, I would call my Mom, and she would make some for me. Now that she has passed away, I have to make my own, ugh! However now, times have changed, and potato skins are in vogue, loaded potato skins, and mashed potatoes with the skins left on them, and also Red Skinned Potato Salad, which is what I made. See the red skins on the potatoes in the picture? I used the baby red potatoes, which makes cutting the potatoes much easier. There are so many versions of potato salad, red or white potatoes? Mayo vs. Miracle Whip?, Oil and vinegar? Mustard or no mustard? Skins on or off? hot or cold? Every family has their own recipe, maybe even passed down for generations. What type of potato salad do you make? Do you have trouble cooking the potatoes to the perfect firmness? Are they too soft, or too hard? These potatoes turned out perfectly, according to my Hubby. Besides the baby red potatoes with the skins left on, my potato salad had Miracle Whip dressing with a little yellow mustard and vinegar, celery, hard boiled eggs, green onions, celery seeds, and fresh parsley from our herb garden, which has huge leaves now. I don't like mayo, so it's Miracle Whip for me. This is basically the dressing my Mom used, minus the fresh parsley. Thank you Mom:) Anyway, this potato salad is so good, and even tastes better the next day, if you have any left over. Also, it's much easier to leave the skins on, and then you don't have to peel the potatoes. Here is what we had left over. Bring a large pot of salted water to a boil. Add potatoes and cook until tender but still firm, about 10 minutes. Watch carefully so that they don’t cook too long. Drain and set in the refrigerator to cool. Place eggs in a saucepan and cover with cold water. Bring water to a boil and immediately remove from heat. Cover and let eggs stand in hot water for 10 to 12 minutes. Remove from hot water and put in cold water, peel and chop. Chop the cooled potatoes, leaving skin on. Add to a large bowl, along with the eggs, onion and celery. Add Miracle Whip or mayonnaise, mustard, celery seed, chopped parsley, salt and pepper to taste. Chill for an hour or longer before serving. 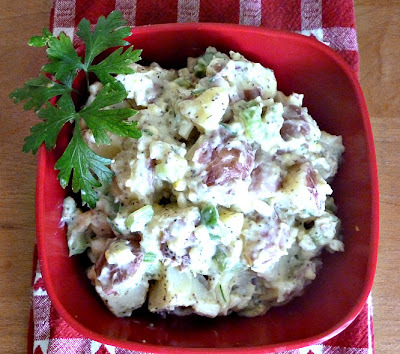 My Red skinned Potato Salad featured on Brandie@The Country Cook's Weekend Potluck #30 Yay!!! I love potato salad, it is soooo delicious! 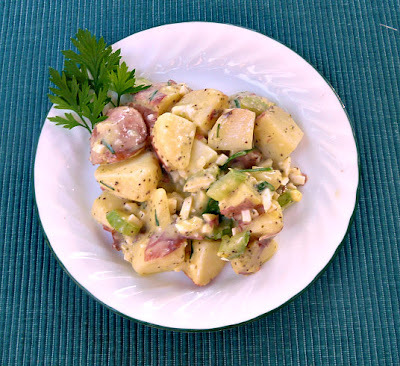 This potato salad is so very flavorful with the herbs and dressing. I'm sure your mom would have loved your version. It's funny how certain memories stay with us forever, little nuances that made our loved ones so special to us. Glad to see you so busy baking and cooking, sounds like your cookout went well too, even if you didn't get any photos. I could go for a nice big bowl of potato salad. There are little sayings that my Mom said that rattle around in my head, all the time. Because my Mom had Southern roots, those sayings have that Southern accent, and they will stay with me forever. This is my week to get ready for my marathon cooking session next weekend, so I will be very busy. I will take pictures, next weekend. Your mum would drool over this version too my friend, it looks incredible - red potato is irresistible! I hope that my Mom would like this version. She was pretty flexible, when it came to cooking. Even thought I don't eat potatoes or mayo... I have to say this looks like one I would have to sample! I don't eat potatoes, as a rule either, (I did have a spoonful of this potato salad though) It does taste very good. It is worth a sample. This looks good. I would eat this. This potato salad is very good with loads of flavor. Mr. Hungry Couple is the potato salad lover and he doesn't mind the skins on the red potatoes so I leave them on. Miracle Whip is actually a little sweeter than mayonnaise. I use regular mayo but add a bit of sugar so it's close to the same taste. Mr. Hungry couple would love this potato salad, my hubby does, and he likes Mayo. There are so many different variations of the classic potato salad, and this one looks like a real winner. Thank you for sharing it with us. I would love to have a big scoop to go along with my grilled chicken tonight! Becky, You are so right about the plethora of variations on this dish. I enjoy quite a few of them. One recipe is from my German MIL, a hot potato salad with a delicious sour punch. Yours not only looks tasty, but the story behind it was delicious too. So good of you to stop by my place this morning and many thanks for your kind words! Hi Becky, your potato salad look very appetizing. Your recipe look good, very nice combination. I must say, I'm with you on the 'peeling of potatoes'...Becky! I love red skin potatoes, and do love it in potato salad with the skin left on. My recipe, which is also inspired by my mom, is almost identical to yours with the cider vinegar, which really brings out the right amount of tartness and the mustard, with the Miracle Whip is which she used. Now, you're bring back fond memories from the sixties, and inspire me to make it just the way you did with the red skin potatoes...Yumm! I'm late...I'm late...for a very important date. So sorry...I just remembered I was suppose to let you know this awesome recipe was featured at Weekend Potluck today. Thanks oh-so much for sharing with us! Triple- Lemon Layer Cake for Birthdays!